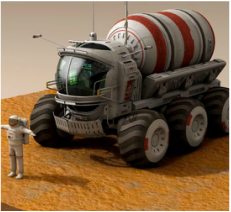 Nasa has asked your engineering team to come up with ideas for the upcoming Mission to Mars in 2020. Nasa needs ideas in 7 different areas of need.Your team will be selected for one area to research and design. You will need to research past ideas, equipment and space missions for ideas and background knowledge. You will need to research and learn what the conditions on Mars are in order to design your part appropriately. Design a space suit that is suited for the conditions that the astronauts on Mars will encounter. Consider the environment on Mars as well as what physical activity astronauts will be doing as they wear the suit. Design a habitat that is suited for the conditions on Mars. What will the habitat contain and how will it be designed in the interior for all the needs of the astronauts. Design the launch and journey vehicle that the astronauts will use to leave the Earth and travel to Mars. Also consider how astronauts will get supplies from Earth as well as the vehicle that will be used to return astronauts back to Earth. Design a menu of food items and how the will be packaged for astronauts. Will astronauts be able to grow or produce any food on Mars? If so, how ill they do it. Also think about how astronauts will obtain water on Mars. Astronauts will be required to go out and do experiments and exploration of the Red Planet. Design a vehicle that will help them do this kind of work. Consider the environment of Mars and what the needs of astronauts would be while riding in such a vehicle. Once on Mars, astronauts will stay for approximately 2 years. This can be a long and lonely time with only 4 to 6 other people to talk to. Astronauts will need time for leisure, fun and to destress. What activities can you design that would help astronauts cope with boredom, lack of exercise and the need for mental and physical enrichment? Energy will be a big consideration on Mars. How will the astronauts produce enough energy to run all their systems and survive. Include at least three ideas. Consider how astronauts will produce this energy using resources on Mars.